Footprint is a design consultancy which aims at providing travel agencies services which would enhance the customer experience and provide touchpoints with the localness of different destinations in turn building a long term brand loyalty. We as designers can play an important role in the service industry where what a customer takes back is an experience. Thus, building and studying scenarios results in giving consumers more than the obvious solutions is the challenge. When people wants to plan their vacations or weekends, there are lots of sources which they can find from search engines. The three main sectors are basic travel agency, luxury travel agency, and government travel agency. Thus, in the competitive market, it is crucial for travel agencies to find the right standing point and then distinguish their services from other competitors’ services. Footprint provides niche points to our clients by means of human-centered approach- VIP+ and Emotional Journey which can help you to generate special market segmentations for your customers and increase brand awareness and loyalty eventually. The ViP distinguishes between the preparation phase and the designing phase. In the preparation phase the current products, product-user interactions and context of those interactions are questioned (Delft Design Guide, 2013). The future context shows the world and its products as it will or should be(right side). Consumers are frequently unable to accurately describe their own current behavior, much less make reliable predictions (Fellmann, 1999,Liedtka,2014). Thus just a customer survey or a feedback does not really help to get an intervention. ViP is a tool that would help make predictions based on the past context and find the missing context which could be a new direction in the future. This is the point in the tool where we make our first change. We would like our clients to intervene at this point in order to give us a thorough understanding of the situation. This process of deconstruction of the context is done to get unique design solutions. The factors determine the solution which would eventually be a part of the design domain, establishing capability of Product Service system (Morelli,2006).The first task would be to envision a context and then fit the interaction model and then the final solution will make the interaction possible. We would like to incorporate a co-creation session with our client at the point where future context building take place. It would be interesting to work with experts and co-create factors and future context.This would eliminate the limitation of using a lot of time to come to a solution.Design consultancies visualization and materialization capabilities reduce clients reliance on intuition in strategic decision-making and improve the effectiveness of intuitive decision making. (Calabretta et al,2014).Vision in product design is a tool that would help the tourism industry to make unique experiences for their customers. The process caters to deep rooted issues faced by the people and adds a new dimension to the experience. The limitations of time is what we would overcome due to our client intervention but our expertise and the clients experience together could help create a new direction and dimension to turn a tourist into a traveller. The most important part of the tool is adding the emotional service blueprint as the next phase in the design process. The original service blueprint tool is an operational tool that describes the user interaction and experience in detail to verify and implement it. ‘A product blueprint makes it possible to reproduce the product or service according to the designer’s intent ‘(Morelli, 2006). It displays all the touchpoints, the backstage process thus giving scope for improvement. We add an important element post the customer journey map , which is the emotional journey. The customer journey map showcases the journey of a user by representing different touchpoints that display his character,actions and his interaction with the service. Observing and mapping current emotional responses in addition to the customer journey in the context of use would help get insights for future context and focus on the area of change. The innovative capability is to give people more than what they would expect. Travel is an experience driven sector thus emotional journey mapping along with the customer journey mapping would definitely help in providing a positive experience to the customer. The service industry often needs to visualize the intangible for which appropriate visualization capabilities, storyboarding and role playing is required. As mentioned in the paper of Michlewski, 2008, it is bringing the solutions to life, in that way you make the intangible tangible for the client. That is an important way of communicating between or within organizations. We at Foot print would be capable of these deliverables. In the case, we briefly describe the process of how we use our approaches. This how Footprint consultancy will work their way to a new design! We chose the famous travel agency Cox and Kings which can be traced its history to 1758 (Cox and Kings, 2014). With VIP+ approach, first we focus on the touchpoints which between consumers and the company. We found out if a customer browses the homepage of the website, there are advertisements everywhere; because from the perspective of the company, Cox and Kings has so much information to offer, but they communicate all of that at once. There is a possibility for distinct consumers to create profiles and in that way Cox and Kings can provide more personalized advice. Nevertheless, the good thing is that they categorize different types of journeys they offer though customers should look for it themselves. For the customer with specific needs, it is the easiest way to find the trip he or she wants. For the general customers, some advice are needed to take them to start perfect trips. 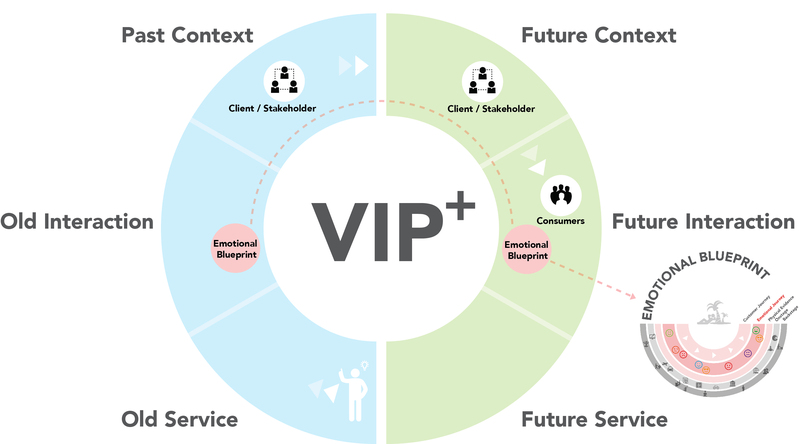 In the second process of our VIP+ approach, we use the emotional blueprint to collect the information of current service problems. For a newcomer to use the website, when he or she looks for a trip, the destination should be clear. However, it is not possible to search for an area first and then see what Cox and Kings can offer there. By using our tool, after we asked participants to test the current website service, we can map the customer journey and emotional journey of their booking process. Thus, Footprint can have a general understanding before we discuss with the company in the next step. Next, we move to the third and fourth phase of VIP+. In these stages, we had meetings with Cox and Kings. Since the travel market is very competitive, there are many agencies who want you to travel with or to them. There are different types of holidays, as one can go on a honeymoon, go to a student trip or visit a city over the weekend. The market can therefore be divided into two main segments: luxury travel and basic travel. And Cox and Kings provides both services on their website. In the luxury travel market segment it is all about experience and comfort. For those travelers the price is not important, but everything should be well organized at travel destination. The customers want and pay for comfort. This is a big segment and has many different target groups. All customers will care about costs, but one does more than the other. They all have different needs and need different approaches. Age, size of the group, gender and so on are criteria which influence the needs and wants of the traveler. Because these segments are difficult to serve and please the emotions of all customer, we proposed a new direction for Cox and Kings. According to our discussion with Cox and Kings and the consideration of brand value, we suggested Cox and Kings to work in the basic travel market segment and serve the different target groups within that context. When searching for the right holiday the different target groups look for different trips. For example, a group of students look for a holiday where they can drink their beers and have some tools in or near the place they will stay. So they will look for a big accommodation, where there is little to break. On the other hand, there is a family with children under four years old. They want a peaceful and quiet place, where they can enjoy being together and walk a little bit with the kids. So they are looking for an accommodation where there is thought of the needs for little children or even babies. Two really different target groups who both look for a holiday at the website of Cox and Kings. They both can be with five persons, but have such different needs and wants when looking for a good accommodation. So a market segmentation is recommended to play with the context. By means of studying the current situation and future vision of with the stakeholders at Cox and Kings, we realized that personalization is a trend at the moment, so a personal approach via a website is needed today. The service a travel agency could give in the store in the past, has to shift to the online platform. With a couple mouse clicks it is possible to book a trip around the world, figuratively speaking of course. The new technologies make it possible to bring the personal approach at home. Therefore, it is possible to play with the emotions of the customer. The client needs to be happy when he is booking his holiday. So in general the customer should be happy, in the different steps in the customer journey it is not always possible. Se Footprint performs an emotional blueprint to reach the customer at emotional level. Finally, here comes our best solution to Cox and Kings. To let customers get access to Cox and Kings easier, we suggested to renew their website design and build a new app which can be installed on both Android and IOS systems. Moreover, about the website design, we emphasized on the communication of visuals, because we understood that different types of visuals can create distinct atmosphere and then affect customers purchase decisions. Moreover, by using some data beforehand the customer can be approached more personal. It is also possible to create an experience that suits the customer. Such as Barcelona does on his website(http://www.barcelonaturisme.com/), where they invite people to get around the city as one of them. So the tourist does not only see the highlights and other parts of the city rationally, but also experience the way of life emotionally. This example will not suit any target group, but that can be made specific via quick login which is on the left column of the new website now. Calabretta, G., Gemser, G., & Wijnberg, N. M. (2014). The interplay between rationality and intuition in innovation decision-making: A study of practices. (2013). Delft Design Guide. In A. Van Boeijen, J. Daalhuizen, J. Zijlstra, & R. Van Der Schoor. Delft: BIS Publisher. Liedtka, J. (2014). Perspective: Linking Design Thinking with Innovation Outcomes through Cognitive Bias Reduction. Product Development & Management Association, 1-13. Michlewski, K. (2008). Uncovering Design Attitude: Inside the Culture of Designers. Organization Studies, 373-392. Morelli, N. (2006). Developing new product service systems(PSS): methodologies and operational tools. Elsevier, 1495-1501.